Heat oven to 350°F. Line large cookie sheet with foil. In large bowl, break up cookie dough. Stir or knead in 1/4 cup flour until well blended. Remove half the dough, and refrigerate remaining dough until needed. Sprinkle 2 tablespoons flour onto work surface. To form top of globe, shape dough into ball; roll in flour to coat. On cookie sheet, place ball on one end. Press or roll into 10-inch round. Remove remaining half of dough from refrigerator. Cut dough in half. To form base of globe, shape one half into ball; roll in flour to coat. Press or roll into 8-inch round. Cut round in half; place half round next to 10-inch round on cookie sheet, rounded edges touching. Bake 7 to 11 minutes or until light golden brown. Cool completely, about 30 minutes. Carefully peel foil from back of cookie; place cookie on tray or foil-covered cardboard. Grease cookie sheet. Coat remaining dough with flour; roll to 1/8-inch thickness. 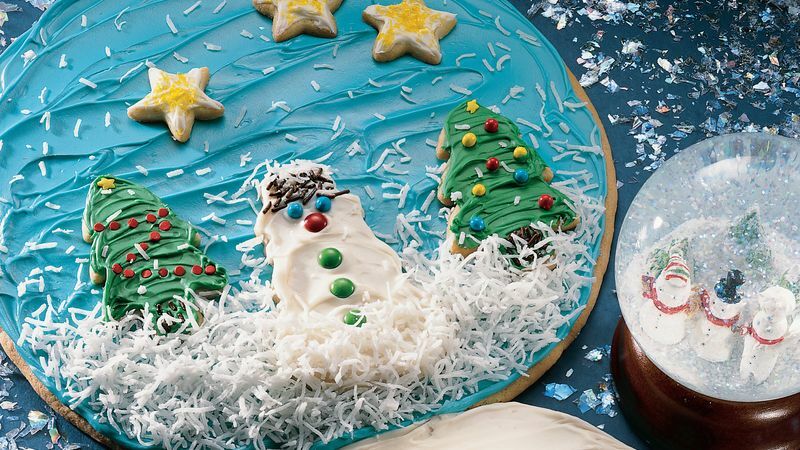 With floured cookie cutters, cut two 3 1/2- to 4-inch trees, one 3 1/2- to 4-inch snowman and three 1 1/4-inch stars. Bake stars 2 to 3 minutes; bake trees and snowman 7 to 10 minutes or until light golden brown. Cool 1 minute; remove from cookie sheet to cooling rack. Cool completely, about 30 minutes. Use 1/3 cup vanilla frosting to frost base of globe. Frost stars and snowman with vanilla frosting. In small bowl, mix 2 tablespoons frosting and green food color until blended. Frost trees. Mix remaining frosting and blue food color until blended. Frost globe. Arrange trees, snowman and stars on blue-frosted globe. Sprinkle coconut to look like snow-covered ground; sprinkle some in "sky" for falling snow. Decorate snowman and trees as desired with candy.